Molds produce tiny spores to reproduce. Mold spores waft through the indoor and outdoor air continually. When mold spores land on a damp spot indoors, they may begin growing and digesting whatever they are growing on in order to survive. There are molds that can grow on wood, paper, carpet, and foods. When excessive moisture or water accumulates indoors, mold growth will often occur, particularly if the moisture problem remains undiscovered or addressed. There is no practical way to eliminate all mold and mold spores in indoor environment; the way to control indoor mold growth is to control moisture. Mold has the potential to cause health problems and make a home uninhabitable. Some mold can produce allergens, irritants and, in some cases potentially toxic chemicals known as mycotoxins. Allergic reactions to mold are common. People diagnosed with allergies and asthma may be very sensitive to mold. Mold can cause asthma attacks. Others at risk may include: infants, children, the elderly, pregnant women, and individuals with existing respiratory conditions. Molds are part of the natural environment. Outdoors, molds play a part in nature by breaking down dead organic matter such as fallen leaves and dead trees, but indoors, mold growth should be avoided. Molds reproduce by means of tiny spores; the spores are invisible to the naked eye and float through outdoor and indoor air. Mold may begin growing indoors when mold spores land on surfaces that are wet. There are many types of mold, and none of them will grow without water or moisture. However, mold will lie dormant until moisture arrives. A visual inspection is the initial step in identifying possible contamination problems. It will identify any visible water leaks or moisture stains using moisture meters, boroscopes, and thermal imaging on ceilings, walls floors or under counters. The air conditioning/ Heating systems, attics, foundations, and crawlspaces will be inspected as well. The inspection will determine if sampling is needed and where the air, tape, swab sampling will take place. The samples are then sent to the laboratory for analysis. used to determine the type and amount of contamination in a building. Both interior and exterior sampling is performed so results can be compared and the severity of the problem may be measured. 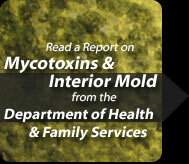 used to collect samples from visible moldy surfaces to identify specific types of molds. It is impossible to get rid of all mold and mold spores indoors; some mold spores will be found floating through the air and in house dust. The mold spores will not grow if moisture is not present. Indoor mold growth can and should be prevented or controlled by controlling moisture indoors. Once the mold circumstance has been evaluated, action can be planned to clean up and or Remediate to prevent future contamination. If there is mold growth in your home, you must clean up the mold and fix the water problem. If you clean up the mold, but don't fix the water problem, then, most likely, the mold problem will come back.